I am an avid reader. Unfortunately, there isn't much time for me to read as much as I want to with all that is going on in life! Also, I get a bit neglectful of things when I get into a book! On vacation, however, I ALWAYS read at least one book. Our trip to Disney was no exception. 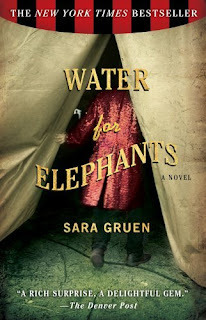 I read Water for Elephants by Sara Gruen. I was drawn into this book from the moment I picked it up. Not everyone that I have spoken with about the book has felt the same way, but we all agree that by the time you reach the end you love the book! Water for Elephants is based on real events surrounding circuses in the early 1900's. I think the era in which the book is set is an element that makes it so mesmerizing. The characters are based on real people and I was intrigued by the life people led in the circus at that time. Whether you are a circus fan or not, it doesn't matter. This book has everything in it to keep you reading and wanting more! Murder, love, mystery, suspense, and history. Hollywood agreed because the major motion picture came out in April! See the trailer here... I just hope the film does the book justice.